So...in transitioning from summer to school, I have been planning some freezer meals. One of those being a my family's favorite enchiladas, which will be a great time saver for me. But, I always feel like I need to add a fresh vegetable side with my mexican dishes, which usually contain lots of cheese and tortillas. I mean, you can't really have broccoli with cheesy enchiladas, and I hesitate and making a side of rice...so I decided to try my own version of a spinach corn salad with a habanero hot sauce. That way, I'm happy that my family will be getting our traditional tex-mex flavor and some veggies on the side. Here's how easy it is. You can put this together in the time that they enchiladas are baking in the oven! 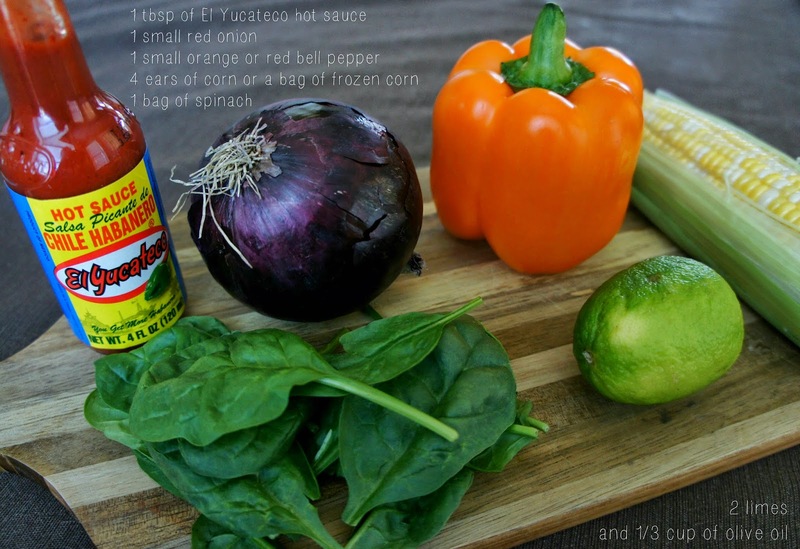 Ingredients: 1 tablespoon of El Yucateco hot sauce (any flavor, there's 4! 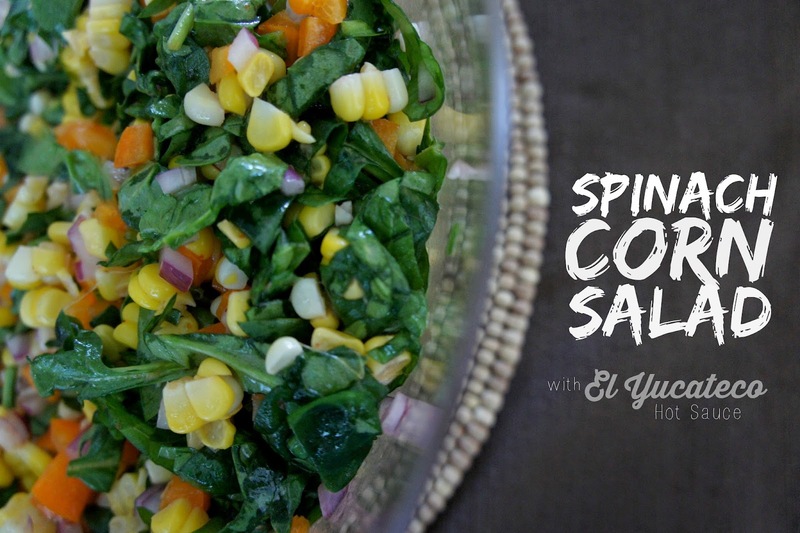 ), olive oil, 1 small red onion, 1 small orange bell pepper (or red if you prefer), 1 bag of prewashed spinach, 2 limes, 4 ears of corn or a bag of frozen sweet corn. This is great to pair with my enchilada bake! I am hoping to share my recipe soon, since I've been on a freezer meal kick lately! 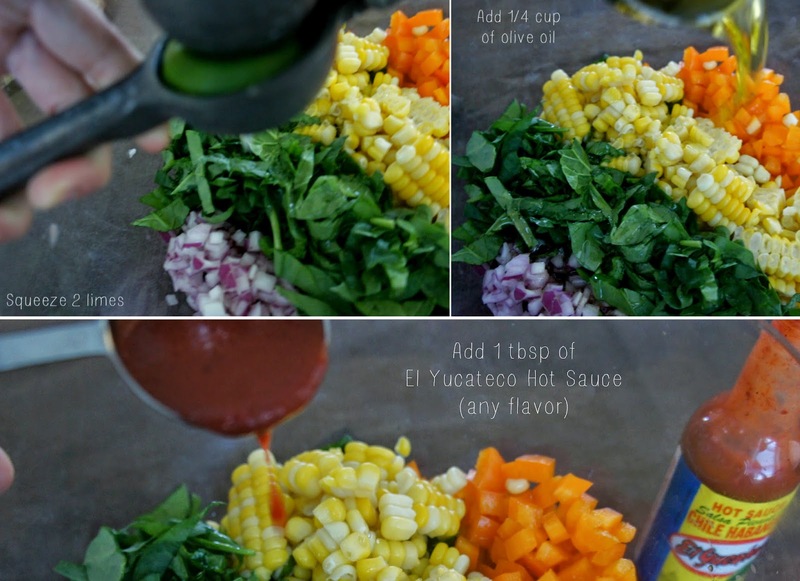 You can also find more recipes on El Yucateco's website or on Facebook page. I promise that one tablespoon of the hot sauce is pretty mild with all of the ingredients. I use a mild sauce in my enchiladas and my children are pretty use to the spice. It doesn't "pica". But if you are looking for something more spicy, El Yucateco has four types of hot sauce: Red Habanero, Green Habanero, XXXtra Hot Kutbil-Ik which is a Mayan word for crushed chili, and Black Label Reserve that you can only find at Walmart. And yes...they are all in the Hispanic section. If you are in San Antonio, the Black Label can be found for sure at the smaller Walmart on SE Military.